Jacob Tonski’s Balance From Within looks like an illusionist’s trick, but it’s really a clever bit of engineering, applying space-age technology to an old-fashioned piece of furniture. 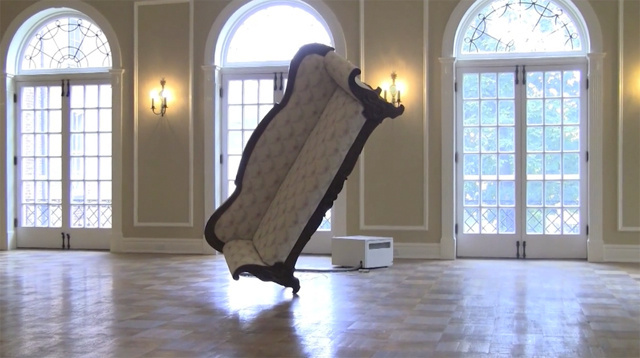 Tonski, an artist who teaches at the University of Miami, Ohio, found a broken-down sofa from the 1840s, took it apart and installed a reaction wheel, a rotating device often used to reorient satellites or telescopes. He then added a second axis to the reaction wheel, which allowed the sofa to balance, as if by magic, on one leg. Tonski says the piece is a “meditation on the nature of human relations, and the things we build to support them.” He notes that a wide range of human interactions take place on sofas, and that they need to be solidly built to support our delicate relationships. The sofa’s mechanism self-corrects when the piece is touched gently, but if it is pushed too far, like a relationship, it can break apart. Fortunately, the pieces of the sofa are held together with strong magnets, allowing it to be rebuilt quickly and easily, unlike a relationship. Oh, well. Metaphors are never perfect. Balance From Within is currently on display at the FILE festival in Sao Paulo, Brazil until September 1. You can watch a video of the sofa in motion here. This entry was posted in The Art of Science and tagged Jacob Tonski, physics art, science art, technology art. Bookmark the permalink. Returning to Mason and Dixon, we find them complaining about the fact that there was much cheating going on at the gaming tables. They lost twenty pounds gambling. Dixon suggests that they should take something worth twenty pounds from the castle. He looks around and first chooses an etching, but then decides it is too pornographic to sell. Mason jokingly suggests the bathtub in their room, but Dixon is excited by the idea of taking the tub. Mason protests that the tub must weigh a half a ton, but Dixon says that [mathematician William] Emerson taught him secrets of leverage and suddenly he has the tub standing on end. Mason is amazed by Dixon’s ability to move the cast iron bathtub. He and Dixon exchange jokes. Mason asks Dixon if magnetism is part of his magic but Dixon doesn’t answer. Dixon glides the tub over to the door and then asks Mason to hold it while Dixon checks to see if anyone is on the stairs. Mason is skeptical as to his ability to keep the tub upright, but Dixon promises he will be right back. coming from a musical bodice that plays when it is ripped. Voam suggests they go for coffee, but Mason says he cannot leave the tub. When Mason mentions Dixon’s name, Voam appears to be meeting them for the first time. Voam examines the tub and figures how to gently set it down. He decides it would be a good place to keep his electric eel, named Felipe. Mason is very grateful to get out from under the tub and offers the professor refuge as a member of his surveying party.